War. This is a sensitive subject which has captured the attention and serves as an inspiration to many an artist. It serves as the subject matter for too many works of art. In literature, there are works by Lord Alfred Tennyson, Leo Tolstoy, Charles Dickens, Alistair Maclean etc. In the field of cinema too, we have witnessed innumerable films depicting the various aspects of warfare. Metal music, was not far behind to catch up. Bands like Bolt Thrower, Sodom, Hail Of Bullets etc, have spoken about war throughout the length of their discography. The latest band to join the ranks of such bands is Preludium from Poland. 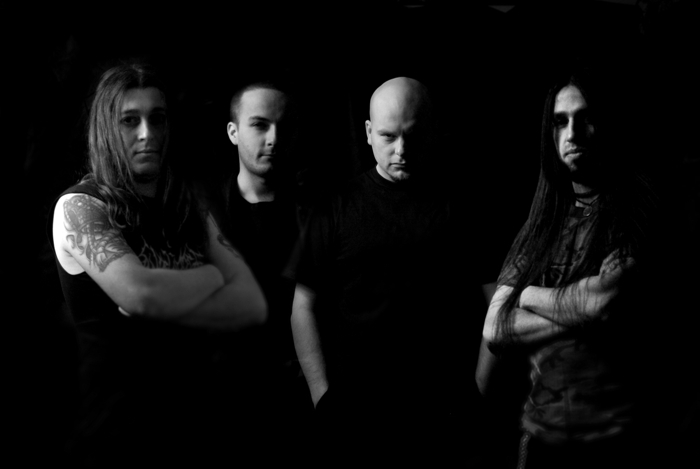 Preludium, is a Black / Death Metal band from Mielec, Poland. They have three full length albums to their credit, with 'Impending Hostility', released on 2nd October 2010 through Diabolical Conquest Records (name changed to Transcending Obscurity now), serving as their third album. Flipping through history, one can see that the country of Poland is no stranger to war. This is shown rather obviously in Preludium's music. The music can be best described as intense and chaotic. It hits you hard in the gut with the sheer brutality that it showcases and it rides on very high energy. It often sounds like music made from all the various sounds that one can find in a battlefield. There is a beautiful order to be found within all the chaos, in the form of brutally sweet guitar riffs. The guitar work by Lukasz Dziamarski and Jan Skowron is a beautiful waltz between Black Metal and Death Metal. While the riffs are predominantly Death Metal influenced, the rhythm guitar work instills a blackened feel to the whole ordeal. This Black Metal influence establishes a grim atmosphere over the album. The band effectively creates a war like atmosphere with this album. Every aspect that comes with war, like desolation, hostility, danger, brutality etc., are portrayed through their music. The songs are generally mid tempo groove pieces. Drumming plays a very key role in this record. Often, the beats laid down by the drummer Piotr Ungeheuer, resemble the war beats that armies tend to march to. Even the double bass work by the drummer is tight and it mimics the sound of bullets being fired from a mounted .50 caliber machine gun. The vocal work by Lukasz Dziamarski, is a mixed bag of low end growls and aptly time high end shrieks. He shows enough variation to keep things from getting too monotonous. The guitar solos are a touch of sweetness a midst all the noise and chaos. The bass is quite high in the mix and the bassist Marcin Deszcz's work is justified by the heaviness he contributes with his bass lines. The raw production brings out the hostility in the music and as mentioned earlier, a grim and dark atmosphere shrouds the entire album. The use of samples like the sounds of explosions, flying airplanes, rolling tanks, pouring rain etc., is a very nice touch as it amplifies the battlefield effect that the band is trying to portray. The songs are short and generally limited to the four minute mark. Within that limited time span, they speak a lot. The production is brutally raw, carrying enough distortion to level the noise that you get in a battlefield. If the contents of an album could be judged merely by the cover art, then Impending Hostility would set a perfect example for this. The album cover shows buildings ravaged by war, set in a dark and gloomy atmosphere. This is exactly what the album depicts musically. It is hard to imagine how Preludium could have done this any better. This is an album that makes me feel bad for missing it three years ago, when it came out and one that I definitely want to add to my collection. This block of heavy smoldering metal definitely deserves to be heard by more people.